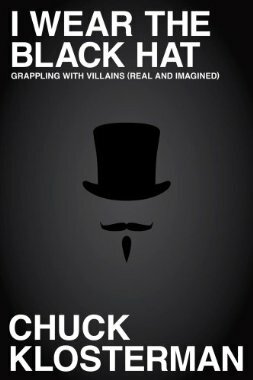 From New York Times bestselling author, “one of America’s top cultural critics” (Entertainment Weekly), and “The Ethicist” for The New York Times Magazine, comes a new book of all original pieces on villains and villainy. Chuck Klosterman has walked into the darkness. As a boy, he related to the cultural figures who represented goodness—but as an adult, he found himself unconsciously aligning with their enemies. This was not because he necessarily liked what they were doing; it was because they were doing it on purpose (and they were doing it better). They wanted to be evil. And what, exactly, was that supposed to mean? When we classify someone as a bad person, what are we really saying (and why are we so obsessed with saying it)? In I Wear the Black Hat, Klosterman questions the very nature of how modern people understand the concept of villainy. What was so Machiavellian about Machiavelli? Why don’t we see Batman the same way we see Bernhard Goetz? Who’s more worthy of our vitriol—Bill Clinton or Don Henley? What was O.J. Simpson’s second-worst decision? And why is Klosterman still obsessed with some kid he knew for one week in 1985? I have been reading too many dystopian teen romances and it is time for a change! Love your choice...definitely something different that provides food for thought. BTW, I follow your blog and am a member of your Book Blogs group.